Today, the term ink-stained wretches is exactly one-third accurate. Journalists aren't quite so blotched from pens and printers, now that the newspaper die-out has wiped out 50 years of advertising gains in a decade. With cleaner shirts, less paper, and worse pay, we're more like carpal-tunnel wretches. We're older on average than we used to be, slightly more moral, and far more lugubrious about the future of our profession. 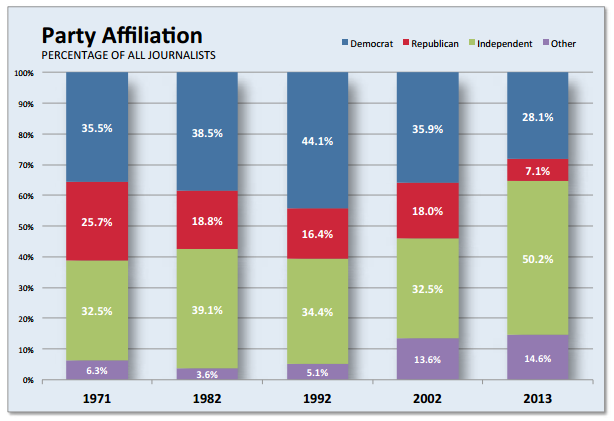 Here is the state of the American journalist, according to a survey from Indiana University. Like the rest of the country, journalists feel more comfortable identifying themselves as independents rather than shacking up with a particular party. But among journalists who align with one of the two major parties, four in five said they're Democrats. Unambiguous proof of media bias? Perhaps. But this is a poll of all kinds of reporters and editors, not just political reporters. Plus, the rise of explicitly ideological media in the last generation, on TV and the Web in particular, makes the question of "bias" somewhat moot in many cases. If you're getting your news from a source you understand to be liberal or conservative, you're consuming the bias you're seeking. If there were a tremendous shortage of conservative journalists to fulfill the demand for more conservative news, this might actually be good news for those conservative journalists: It should make it easier for them to find a job and demand a high salary. 2. They're sadder about their jobs. The size of America's newsrooms peaked in 1992, but since then the profession has lost a third of its workers, and 60 percent of journalists say their newsrooms shrunk in the last year. Even before the industry reached its employment saturation point, job satisfaction had taken a plunge, down from a high of 49 percent in 1971. It might be a heyday for speed, data, infographics, and diversity of accessible media, but not all journalists are feeling the love. A clear majority think the Fourth Estate is headed in the wrong direction. 3. They're older (than you'd think). America is getting older. Journalists are getting older faster. The industry's median age has increased from 32 to 47 in the last three decades, during which time the age of the typical American went from 30 to 37. 4. They're mostly guys—but that's changing. ... there are slightly more women than men. To be clear, this graph below shows years in the profession, not age. So while I think it's reasonable to assume that twentysomething journalists are the most gender-diverse generation so far, this chart could also reflect the fact that women are more likely to leave the profession early, either to change jobs or drop out of the workforce (e.g. to raise a kid). $53,600 as a median salary (for men) is not a pittance. It's exactly the typical household income, according to Census figures, and it represents almost 2X the median per capita income. It's also pretty much in line with a typical bachelors's-degree salary. But, like the rest of the country, journalism wages aren't keeping track with inflation. According to the Bureau of Labor Statistics' inflation calculator, a 1970 salary of $12,000 translates into a $72,000 for men today. Journalists' actual salary today is about 35 percent lower. I've now written "for men" twice. For women, the median income gap in journalism is considerable. Women make $0.82 for every $1.000 earned by a guy in the 2012 survey. In 1970, she made $0.64. Progress, but not equality. Journalists in 1992 basically had no ethical code. Or, if they did have an ethical code, it was buried under their aggressively extra-legal instincts to get information by bribes, lies, and hidden microphones. More than 60 percent of journalists said it would be fine to get a job simply to expose the company (the '90s would have loved Edward Snowden) and 20 percent said they were fine with lying to sources or bribing them. Today, we're either more moral, less dedicated to The Truth, more scared of getting caught, or some combination of the three.